When we’re stressed out, anxious, or depressed, I know it’s tempting to curl up into a ball, watch movies, and stay in bed. While these actions may seem like a good idea, the answer to feeling better is actually to get up and move. Exercise plays an important role in our health. 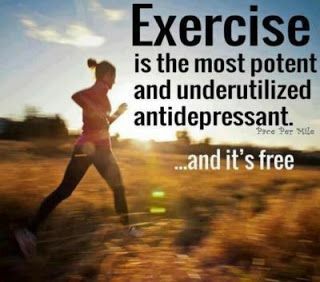 When we exercise, we release endorphins, which are the chemicals that create a positive feeling in our bodies. We all have an exercise routine we love, whether it’s running, hiking, biking, walking, swimming, doing housework, practicing yoga, dancing, doing pilates, or something else, we have to stay active. By doing so, we will not only be physically fit, but we will also increase the “feel good” hormones in our body, which can assist in dealing with depression, reducing stress, alleviating anxiety, increasing self-esteem, and more. What I love about exercise is that it really has so many positive benefits for us. In addition to making us feel happier and more relaxed, exercise is also important for keeping our hearts healthy and strong; staying active also strengthens our muscles and bones, lowers blood pressure, and exercises such as yoga help keep us flexible. I know that the weather is colder, the days are shorter, and it probably seems like a good idea to just stay put, but trust me, you’ll feel so much better if you dedicate part of your day to getting up and moving. Even if you only have 10 minutes to go for a walk or a quick run, do it! Promise yourself that you will create a plan to stay active. If you’re exercising in the morning, it’s important to warm up first; don’t overexert yourself, especially not first thing in the morning, as this can be a shock to your system. Instead, wake up, have some water, tea, breakfast, and after you digest you can stretch and go for a walk – how great does that sound? Add your exercise routine to your calendar. Join a group exercise program and make new friends who support your healthy lifestyle and encourage you to do great things for yourself. Share your new workout plan with others so that at least one person will hold you accountable. See if you have a friend or family member who will work out with you. Whatever your next plan of action will be, I want you to not only look great, but to feel amazing as well. If you have a medical condition or an injury and cannot exercise at this moment, please try other stress reduction methods such as meditation, massage therapy, and/or hypnotherapy. If you can exercise, then get up and move! If you’re not sure whether or not you can exercise, or what the best exercise is for you, make sure you see a physician who can help you make a safe, healthy decision. A Health Coach is a great resource to have when you’re starting a new exercise plan, want to heal yourself, and need someone who will listen to you and support you consistently. Join me for a free one hour consultation where we’ll create a health program that is perfect for you. Explore my programs and get a sense of which one of these you’d like to try first. Here’s to your health!